We can surely agree that there is both long term memory and short term memory. How is swimming affected by this? And what the heck does swink mean? When we are young we experience the world with a blank slate. Once we have practiced new things long enough, in our short term memory, like walking or talking, they are moved into long term memory. Simply speaking you can do them without actively thinking. So then our thoughts get on with more important things while we continue to control our formerly difficult actions through our long term memory. However like language, small changes begin to emerge; like a local dialect. Similarly, as vehicle drivers, we cut corners, fail to signal properly, roll through stop signs, hold the steering wheel with one hand, and are distracted by roadside curiosities or mobile phones. Vigilant driving can save your life, but concentration takes practice, bad habits can surreptitiously form. Laziness is not the only guilty party to weaken habits. Sometimes a change happens due to an adjustment to an event. For example if you miscounted your strokes into the wall on backstroke and smashed into the wall. After that you may always slow down into the wall and look rather than count strokes making your turn slower than it should be. Maybe you hit another swimmer head-on. 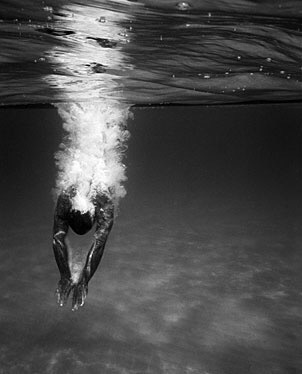 After that you will swim looking forwards with your head up high. Another example is a swimmer may have swallowed a lot of water and so they change to raise up their head very high to get their mouth far from the surface. If a swimmer doesn’t know they have changed then they won’t change. So it becomes their new ‘normal’. An inexperienced instructor or coach may innocently describe a stroke section completely wrong but it may still give some forward propulsion so its left as ‘good enough’. Sometimes a problem is too difficult to fix and has exasperated the coach like the ubiquitous horror: inverted breaststroke kick. These things must be changed. Right from the entry your mind should be in the present tense. Our brain learns how to do things by creating and sending a complex message to our body. I describe that messaging process, and how it becomes normal to swimmers, like this: The first person to walk across a field covered in snow has a tough time but importantly they leave a steps. The next person follows those same steps and over time a path is created. To move out of that path requires a change and is much harder than staying in the path. Creating a new path right next to the original path can be tricky. Paths that are very close together can trick you into the original because it’s an easier and more established way. To create a new path takes vigilance and then to make a change you must swim AND think: swink. Once a new path is created then it will move into long term memory and an automatic system starts to take over. To change a stroke, a swimmer must be explained how and why, plus some experimental drills developed, to learn the new skill. A swimmer then can understand why they are making the change and then are more aware of the reasons behind it. Then the stroke must be monitored periodically to ensure it has been successful. When making changes, one change is enough, but two is possible if it is an interrelated action. This makes monitoring easier for both the swimmer and coach. In a 1-2-1 scenario changes can be made easily and quickly. From that point onwards swinking is essential until the new stroke moves into long term memory. A new path has been created and the old path becomes covered over. Without swinking you will sink. This entry was posted in General Knowledge on swimming and tagged Coaching, Freestyle, motivation, open water, psychology, sports psychology, swim, swim training, swimmer, swimming, teaching, training. Bookmark the permalink.